November 11, 2018 marked the 100th anniversary of the Armistice, officially ending World War I, one of the deadliest wars in global history. Europe and the US both saw ceremony and remembrance for the fallen soldiers of this war. As we remember those who made the ultimate sacrifice for country, we also remember the many men from New Jersey fought and died in this war, including the healthy number of Hopewell residents. Service was not limited to the men of Hopewell, though. Alice Blackwell Lewis's Hopewell Valley Heritage lists Grace Anderson, the first registered nurse of the Hopewell area to enlist in 1917. As US participation in the war drew to a close, the service of all was celebrated and memorialized. 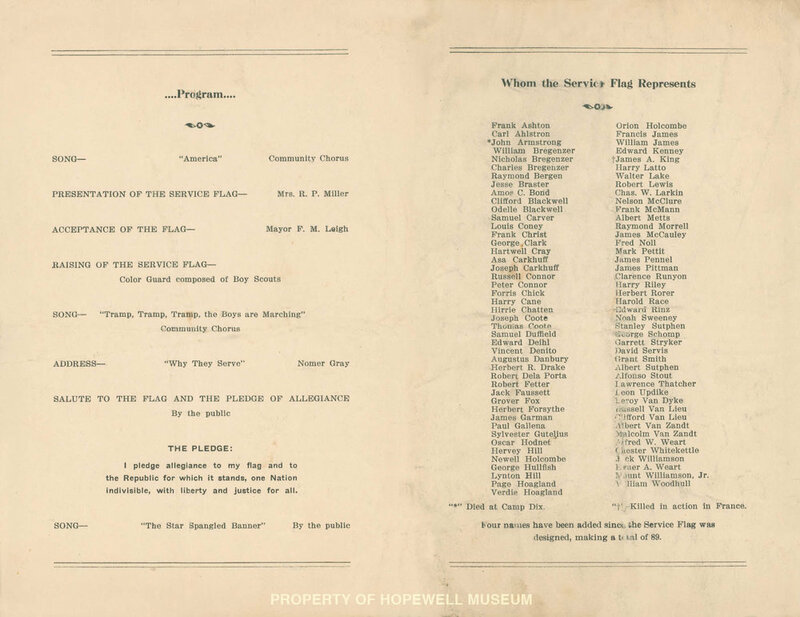 A paper program from August 1918 details the official ceremony raising the service flag and banner donated to the Community Welfare League, honoring those Hopewell area men who served in the war. The 89 stars of the flag each commemorated the service of area men who served overseas, with blue stars for each serviceman who made it back home, and several gold stars indicating those who didn’t. In the above undated photo, a parade of a few of those men in uniform march on West Broad Street. From left to right starting in front we see Vincent DiNitlo, Harvey Latto, and Herbert Rorer, all of whom feature in the list of servicemen honored on the service flag. 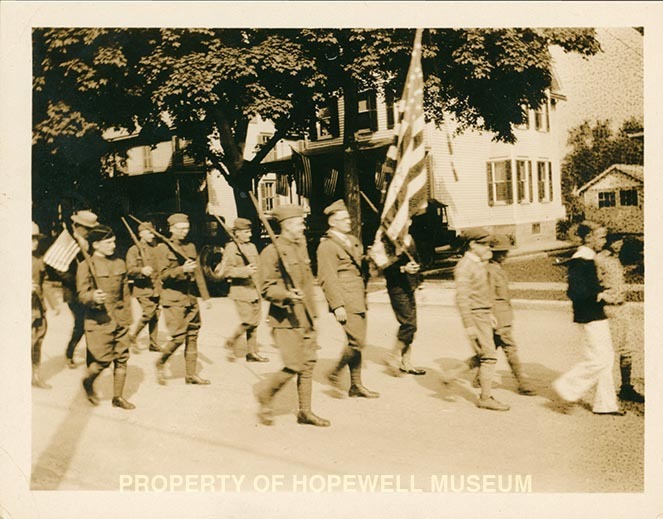 An exhibit honoring the service of Hopewell residents in World War I will be unveiled at the Hopewell Museum’s Holiday Tea, December 2. See the Museum Calendar for more details. One of the side benefits to all the reorganizing work done here at the Museum this summer has been the reminder of the depth of our photography archive. 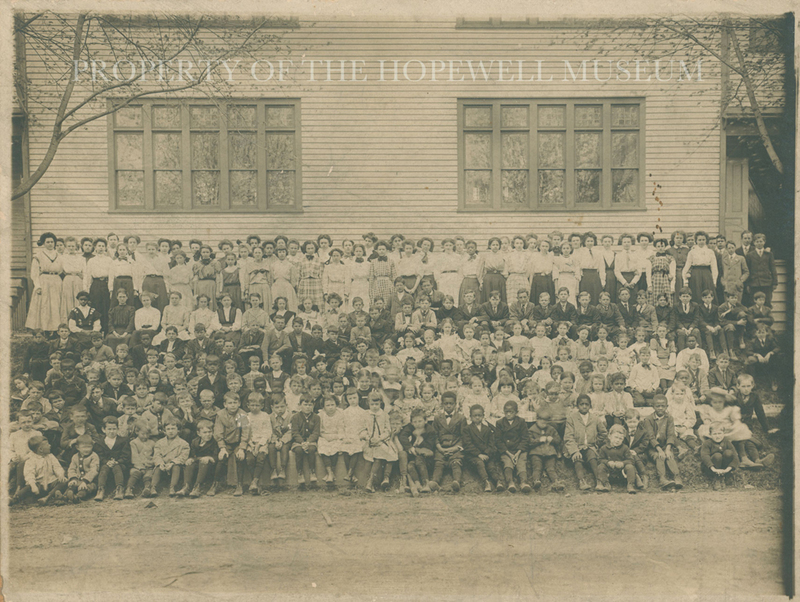 Part of that archive is a fair number of photos documenting the classes of school children in Hopewell over the last 150 or so years. 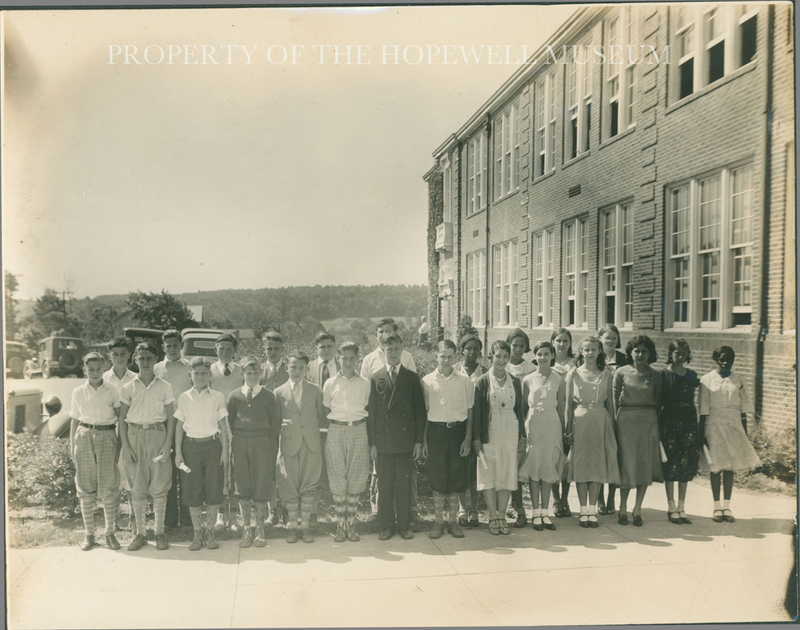 September is the month that Hopewell children go back to school and through these photographs we get a glimpse into the life of old Hopewell and its commitment to educating children. Hopewell borough had several locations that served families from its earliest days. The top photo shows the grammar and high school classes ca.1896 occupying the schoolhouse on Model Ave., a building that has since become residential apartments. The center two photos show the graduating high school classes of 1920 and 1924 respectively in the building that was Hopewell Borough Hall on Columbia Ave. and is now the Hopewell Volunteer Fire Station. 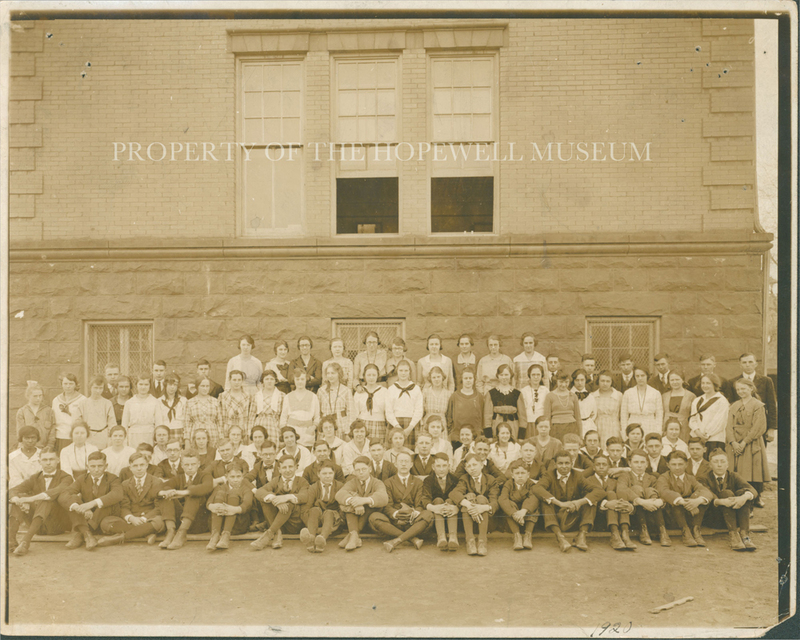 The bottom photo shows one of the first classes of the new Hopewell Grammar School in 1932 on Princeton Ave. not long after it was built. After a brief "closing", the Hopewell Museum has opened its door after many weeks of proper clean-up, set-up, re-organization, categorizing, storing, photographing, training, educating, filing, and reporting. We apologize for the inconvenience but, we hope you will agree, when you visit, you will appreciate the effort to redesign the spaces to create a charming historic museum for you to feel welcome and enjoy. As the museum increases programing and operation hours, there will be a need for volunteers. It’s a great way to meet and serve our little community. Please inquire within. The Hopewell Museum is located at 28 East Broad Street, in the Borough of Hopewell. The Hopewell Museum remains free to the general public however, a donation is always welcome which helps sustain the day to day operations. Large groups by appointment and docent fee. 609-466-0103. The Hopewell Valley Heritage Weekend kicked off the Memorial Day holiday with a reenactment of a Civil War military encampment by the 6th Regiment Infantry US Colored Troops (USCT) Reenactors. A steady flow of interested folks ventured to the backyard of the Hopewell Museum throughout the day to experience an historical look at aspects of 19th century military life and learn a bit more about the 6th Regiment and other USCT brigades and their important role fighting for the Union Army during the Civil War. Many thanks to Trenton natives Algernon Ward, Chuck Monroe, and Alfonso McRay for sharing their knowledge of the USCT regiments with the Hopewell community and to Lear & Pannepacker LLP for sponsoring the event. Chuck Monroe (left), Alfonso McRay (center), and Algernon Ward (right) of the 6th Regiment Infantry USCT Reenactors demonstrate regimental formations.